Rapunzel is no longer stuck in the castle and she's available for your child's birthday party. Our Tangled theme party favors and party supplies are perfect for anyone that loves the movie Tangled. 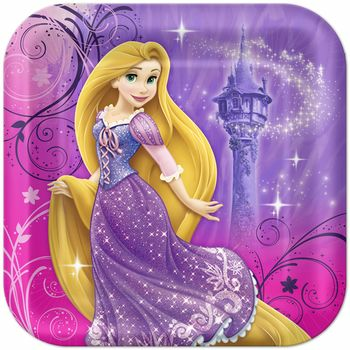 If you are looking for Tangled cups, plates and more, then you'll find a large selection. You'll be the envy of the neighborhood with these party favors and party supplies. Get tangled up in the fairytale with our gorgeous Tangled Party Supplies. Discount prices and a fabulous selection of Tangled Party Supplies means you can really let your hair down. Start with sparkling tableware featuring Rapunzel on a background of jewel-tone colors and pretty swirls. Add delightful decorations to set the scene, and finish with some princess-worthy Tangled Party Favors for your guests. Disney Tangled Birthday Beverage Napkins 16ct. Disney Tangled Birthday Party Invitations, 8ct.